This is Luna our Bantam Barred Plymouth Rock. Every day we let the chickens out of their coop/run into a fenced part of the yard. Usually we free them in the afternoon after they have laid their eggs. The chickens are pretty satisfied in their fenced yard so they don't normally escape unless dusk is approaching or they have to lay an egg. It had been a while since we have seen Luna's eggs. I figured she was laying under the deck, the only place I could imagine she could squeeze that I couldn't' access. Then Luna went missing. If you have chicken you know, they always come home to roost! So I was worried when Luna was a no show two nights in a row. On the third day when I was letting the other chicken out (we are down to only two chickens since my kids can't eat eggs anymore, I gave the other four hens to a friend) Luna came out from the neighbor's yard with ruffled feathers - the kind of ruffled feathers hens have when they have been nesting and come off the eggs to get water or food! After securing Luna in the coop my daughter and I went exploring and what did we find? Luna's beautiful nest full of eggs! Our Barred Plymouth Rock Bantam has been sneaking out to lay her eggs in the neighbor's yard (the neighbors rarely occupy their yard), and she finally had enough of a clutch of eggs she decided to try and hatch those babies. Unfortunately we don't have a rooster so they will never hatch. I tried to explain it to her and I told her that I was going to have to leave her in the coop/run until she could show me that she will lay her eggs in the nesting box. I feel real bad interfering with her instincts to hatch those eggs and to hide them in such fun locations but I'm the grown up and we have boundaries for her own good. I can't have her sneaking out plus I do want to be able to find and keep her eggs - selfish truly. It sure was fun to find her cozy nest! While Flufatrox, our Ameraucana faithfully lays in the nesting box, our bantam really likes to hide her eggs just like my grandpa said of bantams. 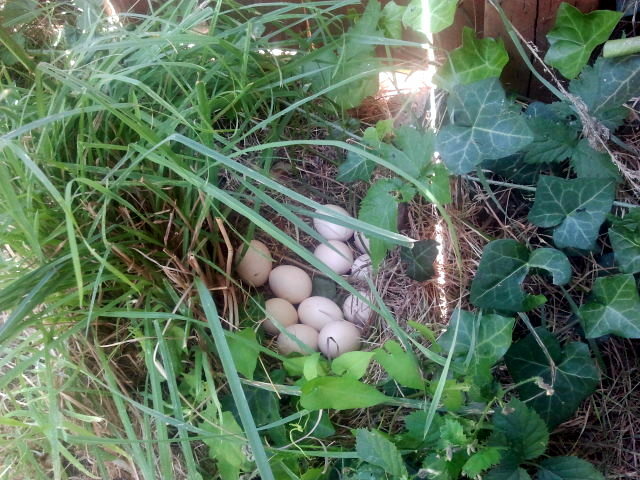 Before this find I have previously found Luna's eggs behind the lavender bush, under a tomato plant, and in a grassy patch. It's like Easter in August. I have had enough with the cheap wire tomato cages that fall over, bend and break every year. Last year I went to buy some more sturdy ones, ones I've seen in people's yards. Unfortunately they cost around $20 or more per cage and I couldn't justify it. This year I have 15 tomato plants and I cannot imagine spending $300 on cages. For that cost I can just buy organic tomatoes from the store and forget about growing my own. Last year as an alternative I grew my tomatoes up by pinching off the suckers using not quite sturdy enough cedar poles. If I did it again I would use metal stakes but I don't want to go buy a bunch of those either. My grandpa gave me a couple cages, the ones he had been using for years that he constructed out of scraps. He never throws away lumber. This year I decided to copy his work. I think the wood cages look really nice in the garden. They are cost effective at less than $5 for the materials per cage. The tomato cage I have constructed is 44 inches high and 15 inches wide with 13 inches between supports. I am very happy with the dimensions. I made a couple cages at 42 inches high and only 12 inches between the bottom two supports for my smaller variety tomatoes but they are not my favorite cages. You could make your cages any size you please. Instructions here are for the 44 inch high cage. I mass produced and just measured as many as I could at a time. Use a hand saw or whatever saw you have to cut the 15 and 16.5 inch rungs and 4 inch supports. Measure, mark and cut the two 2x2's into four 44 inch sidepieces. Line up your four 44 inch 2x2 sidepieces. Using your L-Square measure and mark 13 inches from the bottom on all four boards. Measure and mark 1.5 inches up from the 13 inch mark (Your first 15 inch 1x2 rung will go between those two lines). Measure and mark 13 inches up from the last line (this will be where the next 15 inch 1x2 rung goes). Starting at the top of the sidepieces, nail a 15 inch 1x2 rung flush with the 44 inch sidepieces. To make the second rung, attach another 15 inch rung just above the first line from the top of your board (15 inches down from the top). Attach a third 15 inch rung between the bottom two lines, 13 inches up from the bottom of the sidepieces. Repeat this with the other 44 inch sidepieces and remaining 15 inch rungs so you have two "ladders." Make sure the "ladder" is level by placing it upright on a flat surface and then carefully keep it in place and add a 4 inch 1x2 support under each side of each rung nailing the 4 inch supports to the sidepieces. The supports will keep the rungs from shifting. TIP - To avoid splitting pre-drill each 1x2 every place you will use a nail. Bring the ladders together by nailing three 16.5 1x2 rungs to overlap the edge of the 15 inch rungs. Do the same on the other side to make a square. Make sure the cage is level and add a 4 inch support under each side of each 16.5 inch rung slightly overlapping the supports from the 15 inch rung support. TIP - Start attaching the 16.5 inch rungs, as with the 15 inch ones, beginning at the top of the tomato cage. It will be easier to manipulate or ignore a discrepancy at the bottom of the cage if the boards are warped or the wrong size a little. Finish the project by pre-drilling and then sinking a nail into each 16.5 inch rung where it overlaps a 15 inch piece. You will absolutely love your sturdy, good looking tomato cages and your tomato plants will thank you by flourishing!